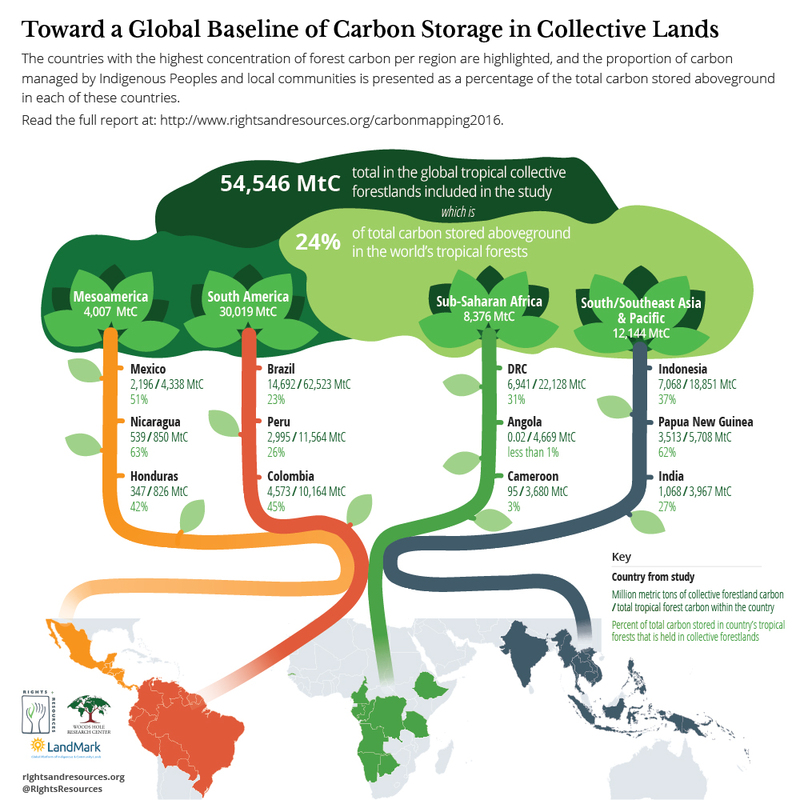 A new report quantifies the carbon stored aboveground in tropical forests that are legally owned or traditionally held by Indigenous Peoples and local communities in 37 countries across tropical America, Africa, and Asia. The report launches a long term collaboration among the Woods Hole Research Center, Rights and Resources Initiative, and World Resources Institute to continue tracking Indigenous Peoples’ and local communities’ role in carbon sequestration globally, with goals of adding data over time for additional countries, relevant non-forest ecosystems, and traditionally held lands that lack formal recognition. 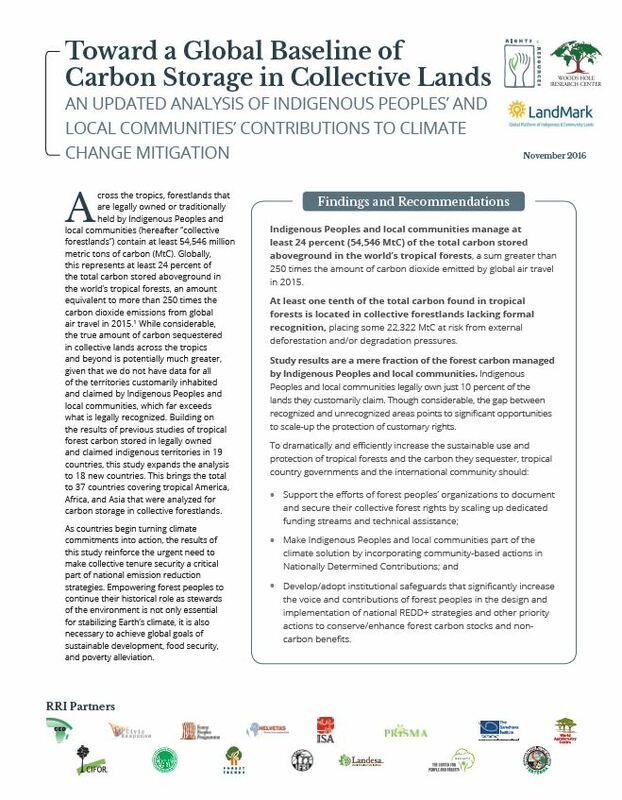 This work is a continuation of groundbreaking studies from 2014 and 2015 initiated by a dedicated group of scientific, policy, and indigenous organizations. Indigenous Peoples and local communities manage at least 24 percent of the total carbon stored aboveground in the world’s tropical forests, or 54,546 million metric tons of carbon (MtC), a sum greater than 250 times the amount of carbon dioxide emitted by global air travel in 2015. At least one-tenth of the total carbon found aboveground in the world’s tropical forests is located in collective forestlands lacking formal recognition, placing over 22,000 MtC at risk from external deforestation and/or degradation pressures. Study results are a mere fraction of the forest carbon managed by Indigenous Peoples and local communities. Indigenous Peoples and local communities customarily claim at least 50 percent of the world’s lands, but legally own just 10 percent. The gap between recognized and unrecognized areas points to significant opportunities to scale-up the protection of customary rights.